Do you know how many times have you been swimming at the beach in the vicinity of a great white shark? Thanks to a team called Ocearch, now you can find out if there’s a great white near you. Using GPS-satellite tagging technology, Ocearch is tracking the movement of around 40 great white sharks. A screenshot from Ocearch’s Global Shark Tracker tool. 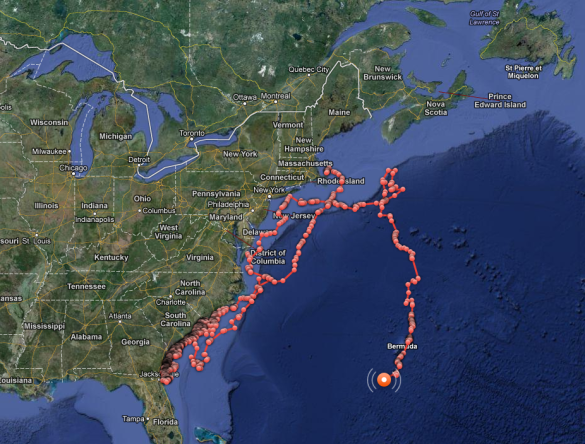 This shows the path of a great white shark called Mary Lee, who has swum along the east coast as far north as Cape Cod. You can view the movement of these sharks at the Ocearch Global Shark Tracker website. To learn more about great whites, see our Great White Shark Fact Page. This entry was posted in Animal News and tagged great white shark, shark tracker by admin. Bookmark the permalink.